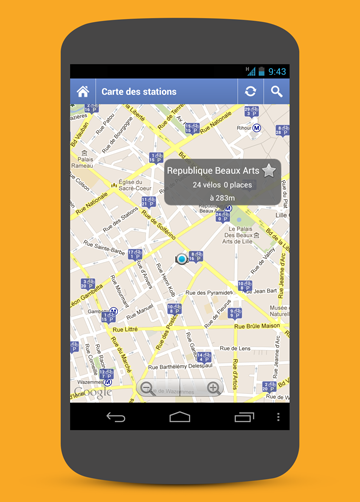 My name is Guillaume Delente and I create Android apps. I am passionate about providing an enhanced mobile experience by developing meaningful, user-focused apps. During the past 5 years, I have worked for several startups and have also launched a few successful projects of my own. These experiences have built on my ability to rapidly learn new engineering tools in a fast paced tech environment. As a startup enthusiast and budding entrepreneur, I am always keeping an eye on the startup scene, ready to take on the next opportunity. About me Expand and collapse content An arrow that points down when collapsed and points up when expanded. I chose to focus on Android development because I truly enjoy it. I realized how high the limits are when you specialize and I believe that technical mastery is essential to releasing the best product. By writing solid, elegant and well-architected code, my goal is to deliver the best user experience while keeping the development cycle as short as possible. I am especially interested in embracing new technologies/paradigms as much as I can in my apps, such as reactive programming or dependency injection. The Android environment has changed rapidly for developers in the past years (build system, IDE, etc.) and being part of that change is a really exciting time for me. Even though my main area of expertise is the Android platform, most of my personal projects use APIs developed with Django or Ruby On Rails that are deployed on Heroku or Amazon EC2. I was born and raised in the South West of France, surrounded by the ocean and vineyards. I used a keyboard for the first time in 1998, when my father bought the first family computer. A few years later, I taught myself HTML and began creating websites as a hobby. My mom was always yelling at me because nobody could reach us on the phone while I was using up all the time left on the 24 hours/month 56k voiceband modem plan. I decided to study Computer Science when one of my websites reached 10,000 daily views, allowing me to make a significant amount of money for a 15 year-old kid. Work Expand and collapse content An arrow that points down when collapsed and points up when expanded. Brightwheel is the all-in-one app for Daycares and Preschools. 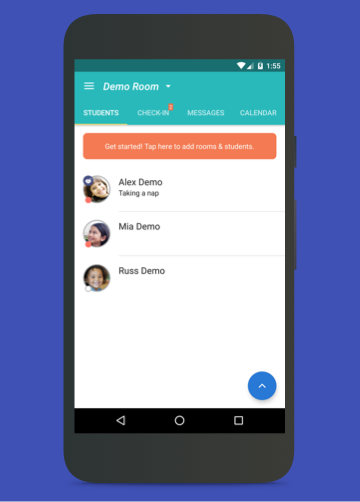 Schools can manage their students, track attendance, log activities and stay in touch with families. Parents get real-time updates on their child’s day. As the mobile lead at Brightwheel, I focus on providing a delightful experience to both Teachers and Parents. Find your new home or apartment to rent. Lovely works with 50+ data providers to make sure it has the best, most up to date listings around. 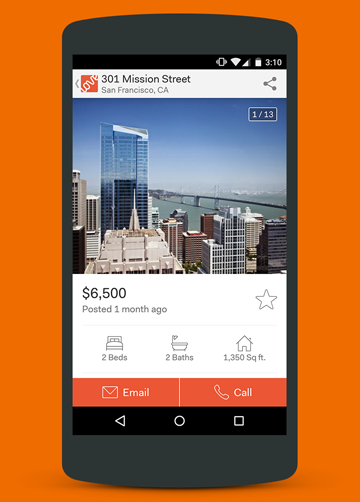 Three months after I joined Lovely, we shipped the first version of the Android app. We have been featured in the Play Store and Google gave us the "Top Developer" badge. Be in the know, anywhere, anytime. Create alerts for your brand, your industry, your company, your name or your competitors and be informed in real-time about any mentions on the web and social web. 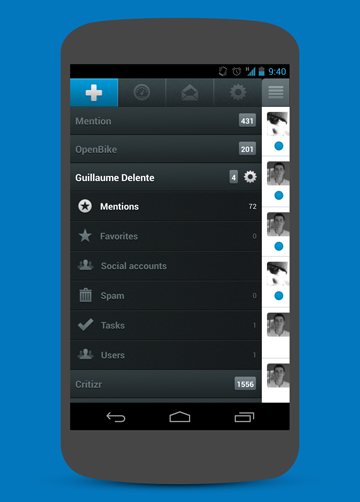 I worked remotely on the first version of Mention's Android app for over a year. 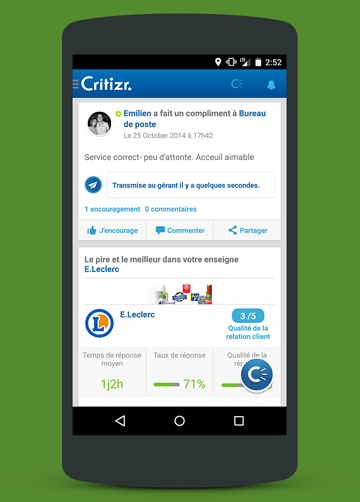 Send feedback to any point of sale in France and get a response directly from the owner. Vote up useful comments by other users and help enhance the places you like. Critizr's founder is a very good friend of mine - we met in grad school. This was my first exposure to the startup world and I had the chance to work with them while they were in an incubator, going through the whole fundraising process. Pick a destination and send your ETA to friends and familly. 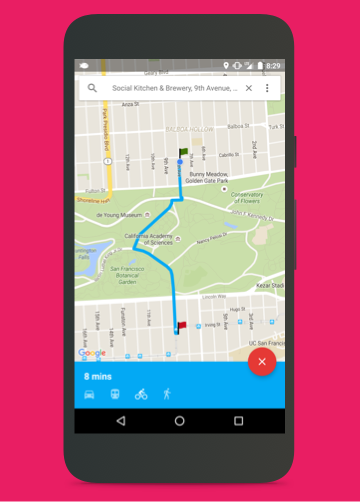 People you have shared your location with will be able to track your progress on the map from a browser. Pictures of the food of the restaurant you're at. 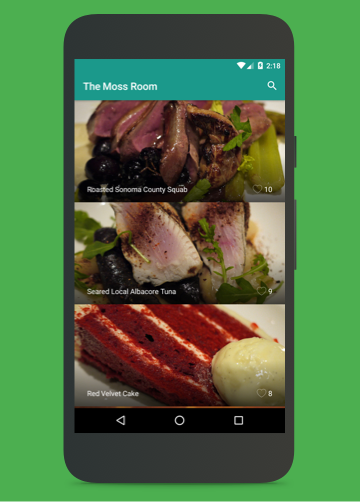 Dead simple app to help you decide what to order : open the app and look at dishes sorted by popularity. Live availability of bikes and slots for bike sharing stations in 11 French cities. This side project turned out to be a success because I could see people using OpenBike on the streets. The backend was running on App Engine and I had to scrape the availability data as there was no API. Pick the right place to go out depending on where your friends plan to go. Nighters first started at a Startup Weekend in Bordeaux. Our team won and we decided to go ahead and give Nighters a chance. Working with friends is fun but can be difficult! Facts Expand and collapse content An arrow that points down when collapsed and points up when expanded. I use a "Bépo" keyboard layout, which is the French version of the "Dvorak" keyboard. My favorite Linux distribution is Arch. Rolling release rocks! Good coffe is great, bad coffee is good enough. Don’t look me up on Facebook : I deleted my account a while back. I love wakeboarding and kiteboarding. Education Expand and collapse content An arrow that points down when collapsed and points up when expanded. I graduated early 2014 with a Master’s Degree in Computer Science from ENSEIRB, France, that I finished while abroad at the University of Santa Barbara, CA. In 2010, I received my Bachelor’s Degree in Computer Science with highest honors from Université Bordeaux I. In 2010, I received my Bachelor’s Degree in Computer Science with highest honors from Université Bordeaux I.
I have quite an uncommon educational path; I broke down barriers to get where I wanted to be. After high school, I spent two years at SUPINFO before I realized it was not what I was expecting. I then realigned my goals to join ENSEIRB, which is part of the prestigious French Grandes Écoles. To be considered for admission, I had to receive a diploma from Université Bordeaux I with the best ranking possible. I seized the opportunity and was ranked 3rd out of 110, paving my way to ENSEIRB. I then applied to be a part of the University of California Education Abroad Program, and was selected to study at UC Santa Barbara during the Fall 2012 and Winter 2013 quarters. After completing my thesis, I graduated with a Master’s degree in Computer Science from ENSEIRB.